Gurkhas originate from the mountainous region of Gorkha, one of the 75 districts of modern Nepal. The name was also used by a kingdom formed by the unification of the territory in the 18th century. The kingdom fought a war against the British East India Company, beginning in 1814 and ending in a peace treaty signed in 1815 and ratified in 1816 after the company's forces suffered heavy casualties. The treaty also meant the beaten British could recruit Gurkhas to serve in their own army. The respected warriors are known for their slouch hats and curved kukri knives. More on those later. Gurkhas have been a part of the British Army since the early 19th century, fighting alongside the British in the Indian Rebellion, also called the Indian Mutiny, of 1857. They stood beside Australian troops in both world wars and also fought in the Falklands conflict and in Afghanistan. Gurkhas have also served for the British in Hong Kong, Borneo, Cyprus, Sierra Leone, East Timor, Bosnia, Kosovo and Iraq. After the partition of India in 1947, an agreement between Nepal, India and Britain transferred four Gurkha regiments from the British to the Indian army. 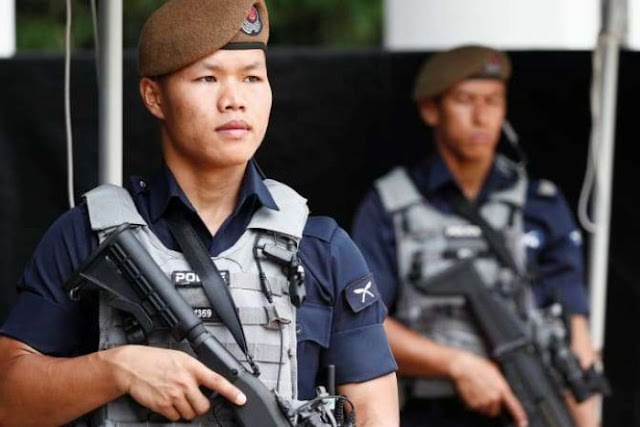 Singapore and Malaysia have also employed them for their own armies and police forces. That is why they will be in Singapore for the Trump-Kim summit. The Gurkhas suffered 20,000 casualties and won almost 2,000 awards for gallantry in World War I. Sir Ralph Turner MC, a Gurkha officer during this time, gave the soldiers their reputation from his quote: "Bravest of the brave, most generous of the generous, never had a country more faithful friends than you". In World War II they fought the Germans in Italy and the Japanese in Burma. Twenty-six Victoria Crosses, the ultimate award for gallantry in the British and Commonwealth forces, have been awarded to members of Gurkha regiments. It is the national knife of Nepal, a working tool used every day in rural communities and also used for ceremonial purposes. Kukris come in many different sizes — including giant versions capable of decapitating a water buffalo. According to tradition, in the past it was said that once drawn, it had to 'taste blood'. So it's probably best to just check out that photo rather than asking to see one IRL. In desperately poor Nepal, a place in the Gurkhas is a route out of poverty for many young men. According to Gurkhas Australia, every year over 10,000 applicants try out for approximately 240 places in the British Army's Brigade of Gurkhas. It is considered one of the toughest selection processes in the world. It includes maths and English exams and a gruelling "doko" race in which potential recruits carry 25kg of sand while running up a steep, 4.2km course. They are also required to do 75 bench jumps in one minute and 70 sit-ups in two minutes. Gurkhas are recruited at 18 or 19 and do not retire until they are 45. Retired Gurkhas who return to Nepal often face financial hardship, and their pensions and right to settle in the UK have been the subject of several well-publicised disputes between the UK Government and pro-Gurkha campaigners. In 2009, the Home Office announced Gurkhas who served between 1948 and 1997 would also be allowed to settle in the UK. That campaign had featured the actress Joanna Lumley speaking on behalf of the Gurkhas. Her father served as an officer in the regiment. How will Gurkhas be protecting Donald Trump and Kim Jong-un? Although the world leaders will have their personal security at the upcoming summit in Singapore, Gurkhas will secure the summit venue at the Capella Hotel as well as roads and hotels. And while the Gurkhas are known for using kukri knives they will also be equipped with guns and bullet-proof vests to protect the summit.